The UF College of Pharmacy is committed to assisting admitted students with their educational costs as they study for the Doctor of Pharmacy degree. The scholarships listed below will be given to pharmacy students who enter the College of Pharmacy in the fall of 2019. The Admissions Committee will make the selections for these scholarships based on information submitted in applications. Award recipients will be notified by email. Funds for these scholarships will be disbursed after the student is enrolled in the Pharm.D. program and has begun taking pharmacy classes. 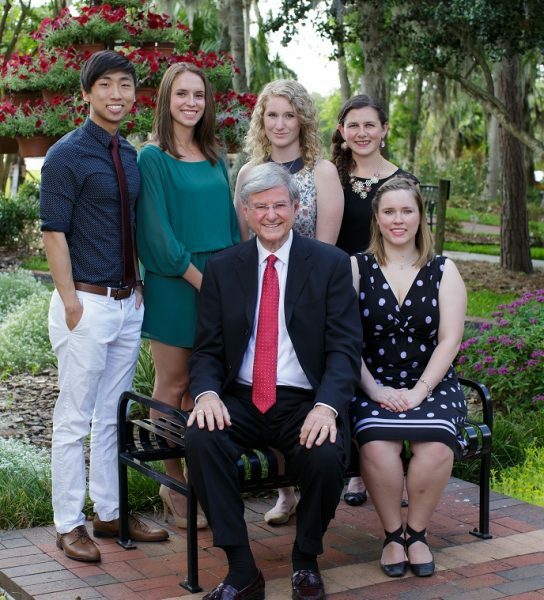 Dr. Bob Crisafi with some of the Crisafi Scholarship recipients. The Crisafi Challenge Recruitment Scholarship supports one of the college’s most critical priorities – recruitment scholarships to attract and retain the best and brightest future pharmacists. Top-tier students in the incoming class are awarded Crisafi Scholarships based on their superior academic and non-academic credentials. The scholarships were first awarded in 2016, after Robert Crisafi, Ph.D., a 1956 graduate of the UF College of Pharmacy, established a fundraising challenge to inspire alumni to give scholarship support. Each year, Dr. Bob provides a match gift that is contingent on alumni and friends of the college matching the total. To date, Dr. Bob has given $70,000 to the challenge, with an additional $115,000 raised by alumni and friends. Every dollar donated in the Crisafi Challenge is given back to students. In 2018, three $10,000 scholarships for admitted non-resident pharmacy students with superior academic and non-academic credentials were awarded. In 2018, eight $7,500 scholarships for admitted pharmacy students (Florida residents or non-residents) with outstanding academic and non-academic credentials were awarded. The Liberty and Eckerd scholarships are for admitted pharmacy students (Florida residents and non-residents) to support educational costs associated with pharmacy studies. The scholarships are based on academic performance, non-academic credentials and financial need. The Eckerd scholarships were established by Jack Eckerd, an American businessman who founded the Eckerd chain of drugstores. Eckerd Pharmacy was one of the nation’s largest drug store chains and was headquartered in Largo, Florida. Generations of UF College of Pharmacy students have benefitted from the generosity of Jack Eckerd’s gift to the college to establish these scholarships. The Charlotte Liberty Family Scholarships were established by the Office of the Vice President of Health Affairs and are distributed among the six academic health colleges at UF. The Charlotte Liberty family made a multimillion dollar donation in support of student scholarships as a way to thank UF Health for the outstanding health care that had been provided to family members.